The following is an attempt to concisely document and best chronicle the bloody events of 9 October in as accurate a manner as possible, considering the amount of time that has elapsed, the concerted attempt at whitewashing the scene of events and the reluctance of many to speak on the matter. The sudden descent into bloodshed and the horrific scenes which ensued, after what had, to a large extent, been a successful display of solidarity and amity, sent many involved into a state of shock. The pandemonium which erupted between 6:15 and 6:45pm and the large exodus from 8pm onwards toward Tahrir Square and adjacent sections of downtown Cairo has also made it hard to collect accurate testimonies. Several of the links below are to videos and photographs which have been included to give the reader a better understanding of the night's atmophsere and to serve as visual aides. As one protester stated: “It is unthinkable that anyone stopped to stare at his or her watch as shots rained down on them and they ran for their lives.” With this in mind, this timeline starts at 3pm and ends at around 8pm. Thereafter, my colleague's timeline will follow the transition of protesters to Abdel Moniem Riad Square, Tahrir Square and the neighbouring areas. 3-3:30pm: Protesters begin to gather at Egypt’s state television and radio building (Maspero), protesting “the authorities’ failure to investigate the burning of a church in Marinab in the southern governorate of Aswan” (HRW report). State run TV has consistently been the target of protests due to wide spread disapproval of its coverage and editorial policies. In short, it is considered an arm of the regime. A march - approved by the government and the military - would begin in Shubra and proceed to Maspero, ending at 7pm according to the 4 October memo. 4pm: An Ahram Online reporter reaches Shubra Square where “around 3,000 had already gathered.” The march begins. 4-5pm: According to several of our reporters, the march was very peaceful, proceeding at a markedly slow pace. “People walked peacefully, holding flowers, crosses and singing Christian hymns. There were lots of priests there as well: some of whom stood in the beds of pick-up trucks with microphones and speakers,” stated an Ahram Online reporter. “A rope, held up by protesters, surrounded marchers as well as human shields - interlocking arms - to protect the women, children and elderly. Within half an hour, the chants turned against [de-facto ruler Field Marshal Hussein]Tantawi,” Ahram Online's correspondent at the march recalls. 4:45-5pm: Candles are handed out to protesters in front of Maspero and a row of them stand along Corniche El-Nil Street, holding their candles in a show of peacefulness. 5pm: A large poster of the field marshal is set alight, according to Ahram Online's reporter. The protesters chanted at the Supreme Council of the Armed Forces [SCAF] “We thought you would unite us, but you actually divided us.” Several of our correspondents mention a man holding a cross dressed in a military jacket. 5:15pm: “There were around 500-700 people gathered around the pergola. Several stood on top, chanting; they weren’t just Christian chants. We weren’t blocking the streets at the point,” a participant stated. Several other participants describe the following scene: The protesters were gathered around the island on which the pergola stood, to the left of the state TV building. Across the street, on the divider, stood dozens of military police and to the right of them dozens of soldiers dressed in riot gear. On the opposite side of the Corniche El-Nil Street, the main street on which Maspero lies, were a couple of army jeeps, a large Central Security Forces (CSF) box truck, another civilian bus, around four army personnel carriers (APCs) and a row of senior ranking officers. In front of the state TV building, were around three to four APCs and dozens of soldiers in riot gear. Around 10-15 CSF box trucks waited further down the corniche underneath 6 October Bridge. Several protesters described how many of the protesters and the miliary standing near the demonstration were “chatty: offering each other cigarettes and water.” Many times protesters would push back towards the pavement to allow cars to pass freely. 5:30-5:50pm: The march approaches Shubra Tunnel. “We found people ahead of us running back and yelling: 'We're being attacked, we're being attacked.' We started hearing gun fire (it is uncertain whether this was live rounds or blanks) and stones were being thrown from all around. All the men pushed the women under the tunnel to protect them and then began fighting back. They ran out to pick up stones (there were piles of stones) and throw them back at the attackers. This lasted 15 minutes,” Ahram Online's correspondent describes. 5:50pm: The protesters standing in front of Maspero begin “reading Tweets as word reaches us that the marchers are approaching; the excitement grew,” according to one participant. 6pm: One participant describes rows of CSF troops heading towards Maspero. The CSF, according to other testimonies, gathered in front of the state TV building. 6-6:10pm: The marchers are now on El-Galaa Street where the state-run Al-Ahram (the most widely circulated daily newspaper in Egypt) offices are located. An Al-Ahram security guard on shift that night describes mostly peaceful scenes. “There was a moment when rocks were thrown,” he states, indicating a solitary impact point on the glass above the doorway. Many vendors along El-Galaa Street until the Hilton described the peaceful nature of the march, mentioning that many were women and children. “There was talk of problems at Ramsis [referring to the Shubra Tunnel] and stone throwing at Al-Ahram’s building, but I saw no signs of weapons or violence as it passed me,” a kiosk owner stated. 610-15pm: The marchers reach Ramsis Hilton. Some take the tight road behind the hotel, Sahil El-Ghalal Street, which also leads to Maspero, while the majority round the corner where the Hilton stands, proceeding towards the already gathered protesters. One protester, who had travelled from Sohag in Upper Egypt for the march, arrived with a pick-up truck which carried speakers and a priest. A couple of other cars drove in as well, parking on the corniche in front of the Hilton in anticipation of the other protesters. 6:15-6:20pm: Within the ensuing moments, the crowd already at Maspero swells forward, spilling onto Corniche El-Nil Street and pushing the row of soldiers standing on the divider. “A few stones flew overhead,” according to one protester. As the marchers approached, small confrontations broke out between protesters and the military on the divider. It seems that many ran forward to break up the confrontations. “Tensions were high, especially in light of the video from the week before. Many stood around watching it during the demonstration. But any flare ups were brought under control. I mean: we were families with men, women and children and priests,” one participant commented. One protester recalls seeing a group from the direction of the march, rushing forward with stones and crosses. The military police fire into the air as the soldiers in riot gear charge towards the protesters, beating and pushing the vast majority into the tight back street, Sahil El-Ghalal, where they begin to rush back towards the Hilton. The rapid descent into pandemonium is captured here. 6:30-6:35pm: The APCs continue running “over people back and forth and then one more time,” according to the same testimony. Another first hand account by a Al-Masry Al-Youm journalist relates a similar scene, adding that “a soldier on top of each vehicle manned a gun, and spun it wildly, apparently shooting at random.” Slowed down footage from Al-Arabiya seems to confirm this. According to several eye witnesses, initially one APC began to drive towards the 6 October Bridge ramp, on the Nile side of the corniche, while the other drove in circles on the building side. 6:35-6:40pm: A military truck speeds down the corniche away from Maspero, as two military jeeps plough into protesters, and another truck rams into a stationary bus, pushing it diagonally across the road. Protesters swarm the vehicles and target the soldiers in these scenes captured on German television. Minutes later the scene appeared quiet, but by now the protesters at Maspero were divided by hoards of soldiers in riot gear. Soldiers rushed at protesters who had made their way to the shops lining the Hilton side of the corniche. 6:40-6:45pm: The APC driving on the building side of the corniche ploughs through parked cars and anything which stands in its way. According to some testimonies, protesters had pushed some cars into the middle of the road to block the APC from reaching them. Several witnesses describe how APCs mounted pavements and crushed cars to reach the fleeing and shelter seeking protesters. One participant sees an APC ramp onto a car, crushing three people hiding behind it. This testimony is corroborated here. Furthermore, several eyewitnesses have recounted soldiers rushing in to beat wounded and even dead protesters after the APCs had passed. A third APC enters into the fray and drives towards the ramp, running over people as it approaches. Note: There is confusion over whether it was the APC which got stuck on the ramp or the military truck. It seems most likely that the truck got stuck, turning on its side. Another APC comes down the Nile side of the Corniche, running over protesters but is prevented from continuing by a crowd of people. Another APC drives by, trampling several protesters in the process. Protesters keep smashing at the stalled APC, setting fire to it eventually. By now, petrol bombs had come into use and one of the jeeps which drove into protesters was also set on fire. The bullet pierced his lower abdomen from behind, wreaking havoc on his stomach. The bullet fractured and lodged itself near his pelvis. 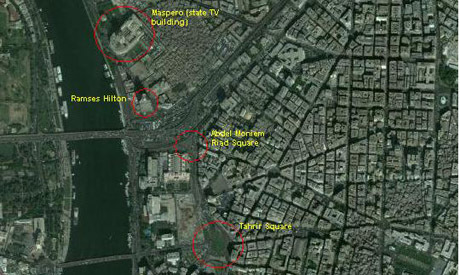 He asserts that all the shooting came from Maspero: none came from the direction of the bridge. 6:45-7pm: Around this time, two soldiers within the now inflamed APC rush out. One, according to several witnesses, flees while another is cornered and beaten. A priest soon comes to the soldiers' rescue. Gunfire continues, as protesters begin taking to the 6 October Bridge. Many participents who had been seeing to the injured and dead are joined by others in some of the apartment buildings between Maspero and the Hilton which have now been turned in to makeshift hospitals. Others rushed toward the Ramsis Hilton as security forces make a concerted push to clear Corniche El-Nil Street. Though it is hard to be pinpoint exactly when, many participants mention army soldiers, at around this point, beginning to throw bodies into the Nile. (This testimony in Arabic and this one in English are among several which recount such sightings). In this Guardian “Live Updates,” the Egyptian Al-Masry Al-Youm daily is cited, quoting eyewitness accounts which state much the same. 7:24pm: Omar Robert Hamilton tweets: Army and young men battling a little on 6th October. Massive crowds still hanging around. 7:25-7:35pm: Security forces begin firing tear gas, forcing many protesters to rush towards Abdel Moniem Riad Square and Ramsis Street. Around this time, the first injuries begin to arrive at the Coptic Hospital in the Abbassiya district of Cairo which later, at around 10, mobs of thugs attempt to storm, setting fire to several vehicles in the process. 7:45pm: A state TV news bulletin announces: “Those injured at Maspero confirm that Coptic Christian protesters are in possession of live ammunition." Note on state TV and other stations: Another bulletin on Nile News soon announces that there have been “two martyrs and tens of injuries among army soldiers after being shot down by Coptic Christian protesters in front of Maspero." At about 8:25pm state television news anchor Rasha Magdy announces: “Three martyrs have fallen, as well as 20 injured, all are army soldiers. And by who? Not by Israelis, or an enemy [to the country] but by the very hands of a certain class of this nation's citizens. This is the army that protected the revolution; the army that refused to fire a single gunshot at its citizens, is getting fired upon, at this moment." According to the Human Rights Watch report, the timing of the 25TV break-in was “at the same time.” The satellite channel was among two attacked during the course of the evening. During a a subsequent press conference, one of 25TV's employees spoke on the raid by military police. 7:49pm: Omar Robert Hamilton tweets:I think i'm the middle of a crowd of militias. Men with clubs and antique pistols. Right outside tv building. 8pm: Omar Robert Hamilton tweets: Looks like thugs being prepared on north side to attack towards the hilton. According to an Ahram Online reporter at the Ramsis Hilton: “Then tear gas canisters began landing very close to where we were standing. Every three minutes a canister would land in our midst. People started pushing back. By 8pm, we slowly started heading back toward El-Galaa Street. I saw protesters carrying a woman who had fainted. I saw several people carrying injured protesters. One man showed me a bullet in his hand.” Minutes later, the very same reporter, describes how many protesters began rushing toward Abdel Moniem Riad Square and Ramsis Street. As Corniche El-Nil Street began to clear slightly, thugs roamed freely alongside military police and security forces. Several witnesses describe having their national ID checked as security forces, military and thugs looked to identify Christians. One young man, whose story was related by his mother, was "walking in the vicinity of Maspero from the direction of 15 May Bridge" at around 8pm when several soldiers gathered around him and asked him for his name. Upon hearing his identifiably Christian name, he was beaten severely, recieving several head wounds. Eventually, he was dragged to the state TV building and held inside and abused further until the next morning when he and 28 others were taken to C28 (military prosecution offices) for booking. The young man and his fellow prisoners have subsequently all been charged with the killing of three soldiers, destruction of property, assaulting army personnel and carrying knives and other such weapons. Illiterate, he was duped into signing a confession to the latter crimes without the presence of any kind of legal representation. Sherif made a great point, but do they know what religion those thugs were? It seems like they are the ones that are causing the problems for the riots, as similar and crazier situations happened at the last protest. Look at the video evidence and make the decisions yourself. The thugs are just trying to stir the pot to allow entry for other extremist political parties to make way. yes a great forensic work, very well documented but will someone be investigated as the "maestro " for this.Coordinating military police, riot police, thugs needs some king of planning and active operation room while events unfold.Who did it ?will the Egyptian people learn a lesson from all this, if I listen to some TV channels : NO, only want more ! A very damning report on the Egyptian military! An interesting account. It is very particularly interesting that the report states that "thugs roamed freely among military police", and at one point thugs were receiving orders from military offices to "move onto the next one [protestor]". The reports begs the question: Are thugs now a branch of the Egyptian Military? As it would appear so, perhaps thugs should now be provided with a military uniform as those serving in other branches! The Egyptian Army has become a disgusting and criminal force that no longer deserves the respect of the Egyptian people. The leadership should be purged and brought to trial.